Have you ever heard of “earthing” or “grounding?” The concept is quite simple – it’s when your body is in direct contact with the Earth. This means skin touching the Earth without any barriers such as shoes, socks, flooring, etc. In today’s digital age, most people rarely have time to practice grounding. Could this possibly be contributing to the rising health challenges we face? Earth has a mild negative electrical charge. Our bodies tend to build up a positive charge from the electromagnetic frequencies that are all around us – cell phone towers, computers, TV, etc. This slight positive charge creates an internal environment in our bodies that is more prone to disease. More and more research is showing that grounding can help to even out the positive charge with Earth’s negative charge leading to improved health. And that makes sense, because while all of the small electronics in our lives can add up to a big impact on our health, the Earth is much, much bigger. And just like the moon moves the ocean, it is not difficult to see that the Earth can have an effect on our bodies. Do you ever notice that you sleep better and feel better during a beach vacation? It’s very possible that the direct contact with the sand and water has a whole lot do with this. There are many barriers to finding a time and place to practice grounding. The weather and terrain isn’t always conducive to walking barefoot outside. This is where a grounding mat can be extremely useful. A grounding mat can mimic the earth’s magnetic resonance and when used over a certain period of time, it has been shown to regulate the body’s natural healing ability. This approach is called Pulse Electromagnetic Field Therapy. It has been used in Europe for over 40 years and is approved by the FDA for bone healing and depression. PEMF Therapy has also been shown to improve circulation, heal damaged tissue, decrease inflammation and stimulate organ function. Any that seems to be just the tip of the iceberg when it comes to functional improvement possibilities. That practice continues to grow in popularity as more and more people experience the beneficial effects of “resetting” our internal frequencies back to our natural state. Research on grounding and PEMF Therapy is ongoing, but there are promising small-scale studies that have been done. 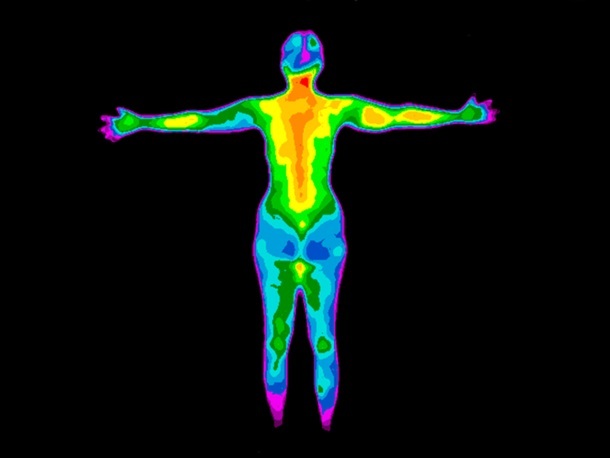 Some of that research is being conducted using infrared thermal imaging (like the technology we use for reading nervous system function in our office) because it shows heat patterns in the body, and areas of abnormally high heat can signal inflammation in the body. In one case study, the thermal image of a woman with chronic pain showed significant improvement after 30 minutes on a grounding mat. Grounding and PEMF Mat Therapy are two valuable tools that you can add to your proactive lifestyle to improve your body’s ability to heal and function. Interested in learning more about grounding and how it can improve your health? Join us in our office on Tuesday, December 18th for more information and try out our grounding mat.